Built inside a 20-foot shipping container placed on its end, the Kamermaker – ” room maker” in Dutch – is one of the largest 3D printers we’ve ever seen. Able to print objects as big as 2 meter square and 3.5 meters high, the Kamermaker is designed to print huge objects including furniture, architectural elements, and even entire rooms. 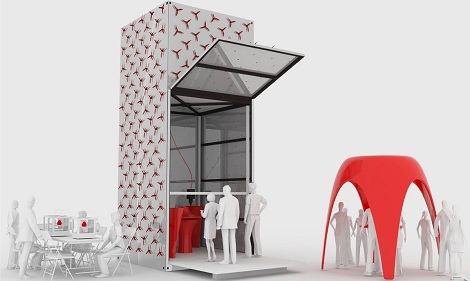 The Kamermaker is a collaboration between Architectburo DUS and Utilimaker and the result of wanting to build the world’s largest 3D printer pavilion. Built inside a stainless steel-clad shipping container, the Kamermaker features a scaled-up version of the X, Y, and Z axes you’d find in any other 3D printer. The only change is a scaling up of current designs, allowing it to print small wind turbines covering its surface or, theoretically, a life-size TARDIS. Because using traditional plastic filament would be prohibitively expensive, the Utilimaker team chose to extrude plastic pellets on the fly as it is used. There’s an excellent video of the filament extruder here along with a walk-through of the machine in operation after the break. We’ve often wondered what kind of hardware the giant of the internet, Google, used to handle it’s data. They’ve recently revealed what their main workhorses are. It’s a custom motherboard made by Gigabyte with two processors, and eight RAM slots. The main point of interest on these is the fact that each server and piece of network equipment has it’s own battery backup. This may add a little money in the initial cost of the unit, but apparently it is a much more efficient way of handling power. Be sure to click over to the site and check out the shipping container setup that they use. Each container has 1,160 servers. They aren’t the only ones using this method. Microsoft has adopted it for their newer facilities and Sun has done some extensive testing on how these portable facilities handle earthquakes. You can see the quake test after the break.